Companies need help with enterprise customer experience transformation. 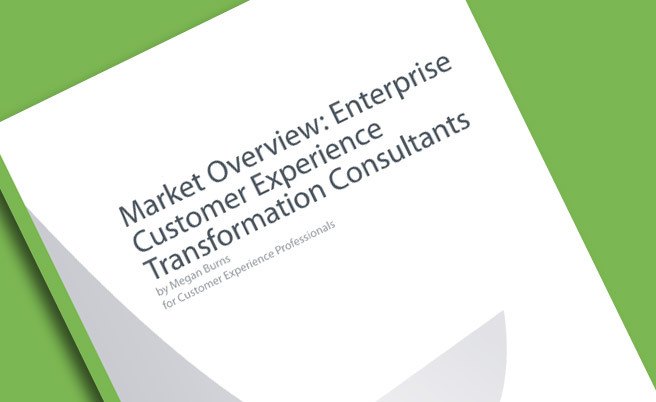 McorpCX was one of the 15 customer experience transformation companies included in the Forrester Research, Inc. report, “Market Overview: Enterprise Customer Experience Transformation Consultants,” authored by analyst Megan Burns. Forrester scanned the market for companies offering enterprise customer experience transformation services and found two types of providers: management consultants and boutiques. All of the 15 vendors interviewed help companies build an initial customer experience transformation road map, and some also execute key steps in that road map like employee training, process redesign, and IT systems implementation. McorpCX is identified as a boutique consulting firm with a focus on defining customer experience strategy, building support for customer experience efforts, creating transformation roadmaps and measuring the business impact of customer experience. More information on the Forrester Research Inc. report is report is available here. Measure the business impact of customer experience over time. McorpCX’s approach is based on the recognition that customer experiences are built (or destroyed) one interaction at a time, over time – at the touchpoint level. And as these touchpoints become increasingly digital, increasingly interconnected and increasingly controlled by customers, the importance of a cross-channel customer experience strategy increases as well.